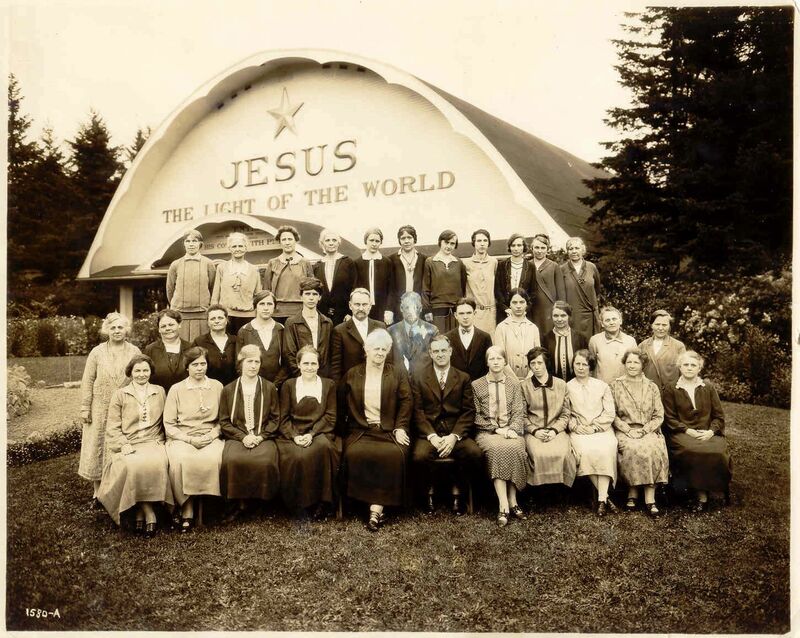 What was the Front & Burnside church like? 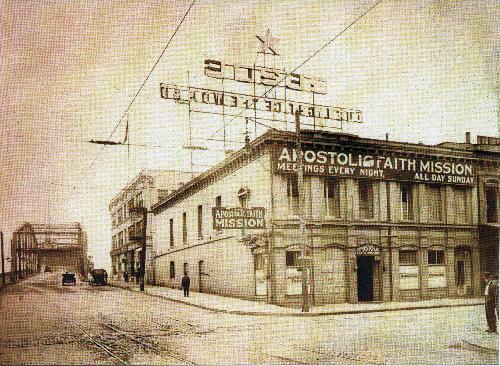 A picture gallery of Front & Burnside and other early church locations. 1. 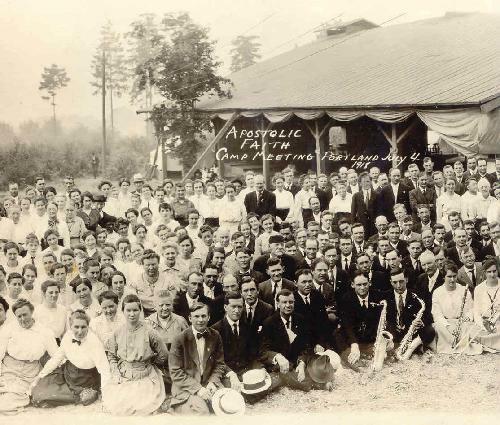 October 1, 1908, following the Mt Tabor camp meeting, the church moved into the upper level above the Portland Tent and Awning Co. 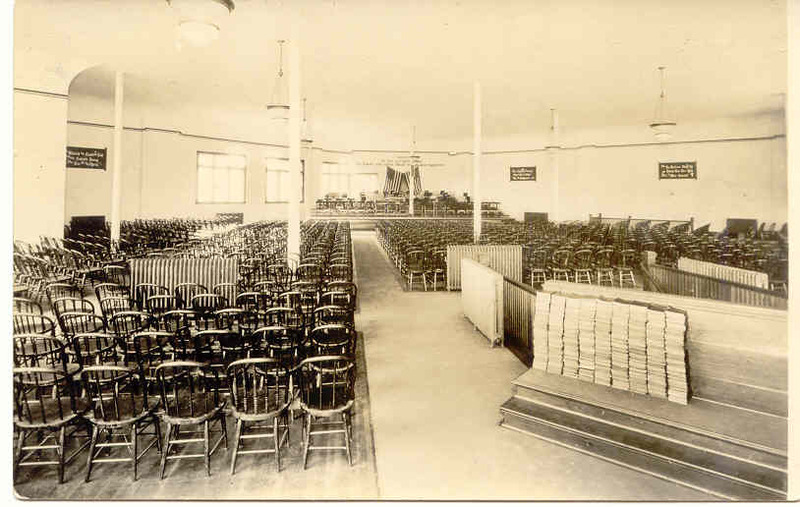 Following the 1909 Montavilla camp meeting they expanded into the space above Specialty Machine Works. 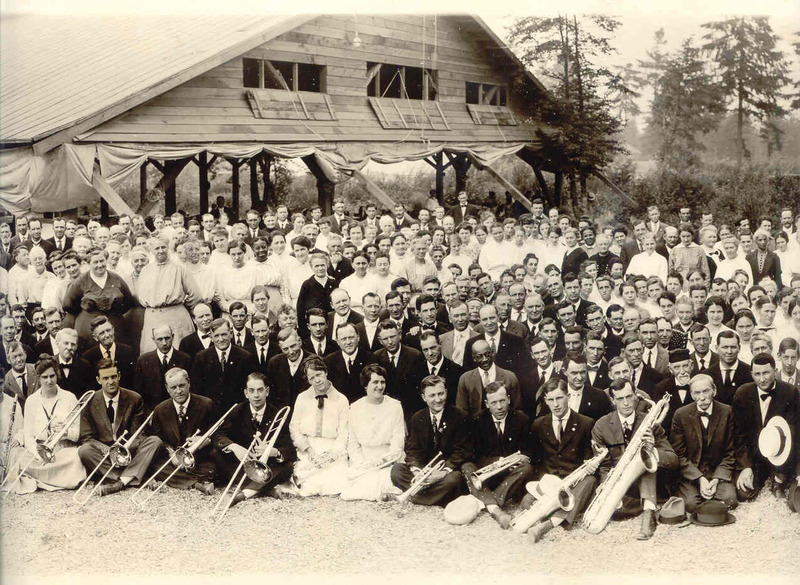 Elsie Ott explained, “We knew that the close of camp (1909) meant to move back to our hall which was already too small. We liked our location fine, so the next thing to do was to try and enlarge it. There was another hall next to ours in the same building about the same size as ours, but there was a fire wall about 1 foot thick between them, and it was not easy to get permission to take it out. But through prayer we obtained permission, and our hall was enlarged to about double its size, giving us a hall about 50 X 90 feet. 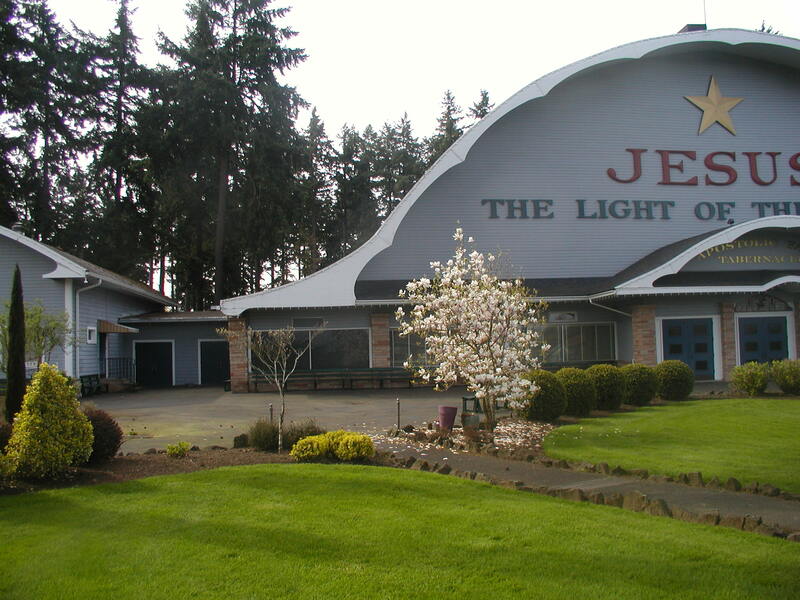 We were proud of our new hall and moved in after camp meeting closed.” Later they also secured the ground floor formerly used by the Portland Tent and Awning Co. and used it for office space. The last meeting held at this location was June 18, 1922. 2. Sunday at Front and Burnside. Line up for a picture! 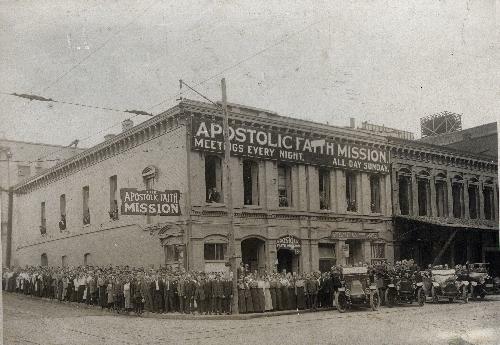 This was the church home from October 1, 1908 until June 18, 1922. Look in the upstairs windows. 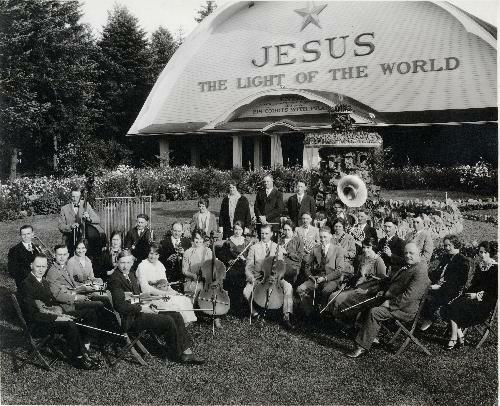 This picture was taken in 1916 before the ‘Jesus the Light of the World’ sign was erected. Notice the autos used for street work. 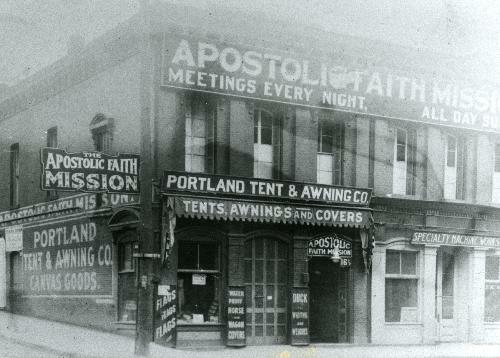 We have now expanded into the space formerly occupied by Portland Tent and Awning Co. and made it our church office. 3. Known as ‘The Light House by the Bridge’ you can see the old Burnside Bridge on the left. Notice that the Portland Tent and Awning Co. is gone. This space became our office and the church bought a Chandler and Price job press to begin doing some of our own printing. They may have also expanded into the space formerly used by Specialty Machine Works. May Allen was one who worked here. Our logo has its roots on the roof of the Front and Burnside Mission. 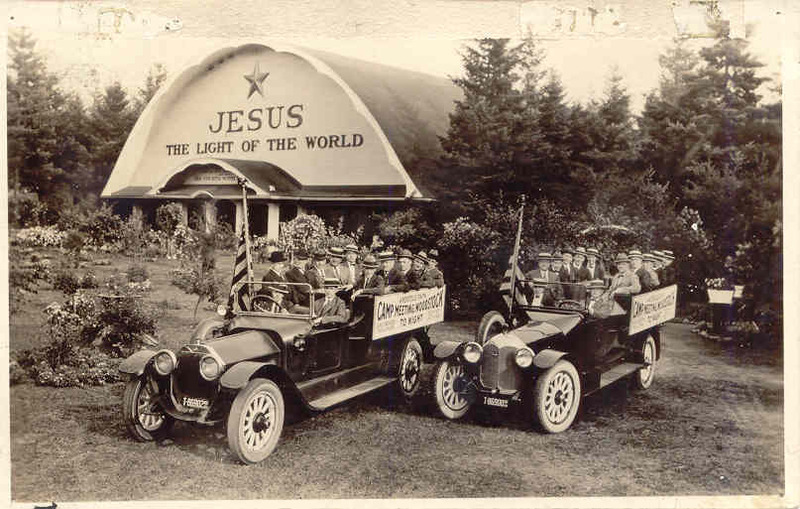 Actually there are two “Jesus the Light of the World” neon signs back-to-back, erected in 1917. They were much more readable from both sides when lighted in the night than during daylight hours. Anticipating this bridge was soon to be torn down and replaced, and that it meant also tearing the mission down, and already getting crowed for space anyway, they began looking for a new location. 4. Seating inside the Front and Burnside church. These center aisle posts were once part of a ‘foot-thick’ firewall separating the floor above the Portland Tent and Awning Co. from the floor above Specialty Machine Works. Notice the generous use of mottos on the wall. 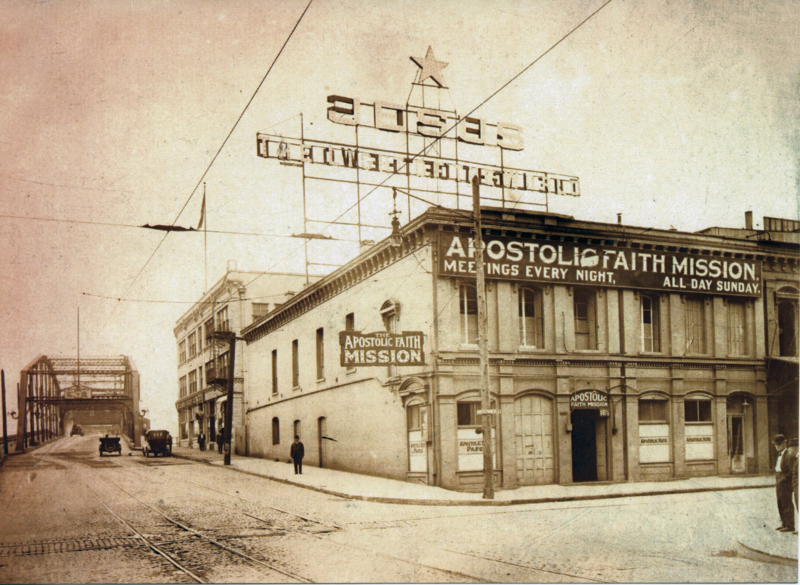 Brother Ray Crawford was saved here October 23, 1908 before the enlargement shown here. Notice the Track Rack. What was the Kenton Camp Ground like? 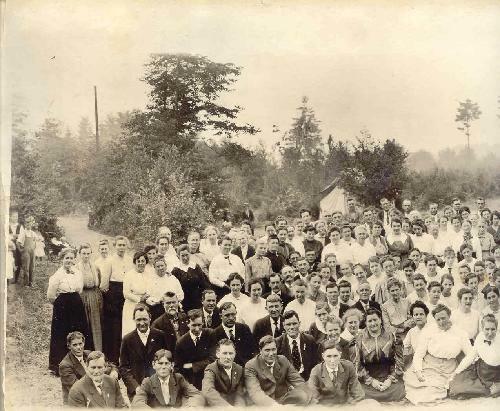 Camp meeting was held in the Kenton District of North Portland each year from 1915 through 1918. 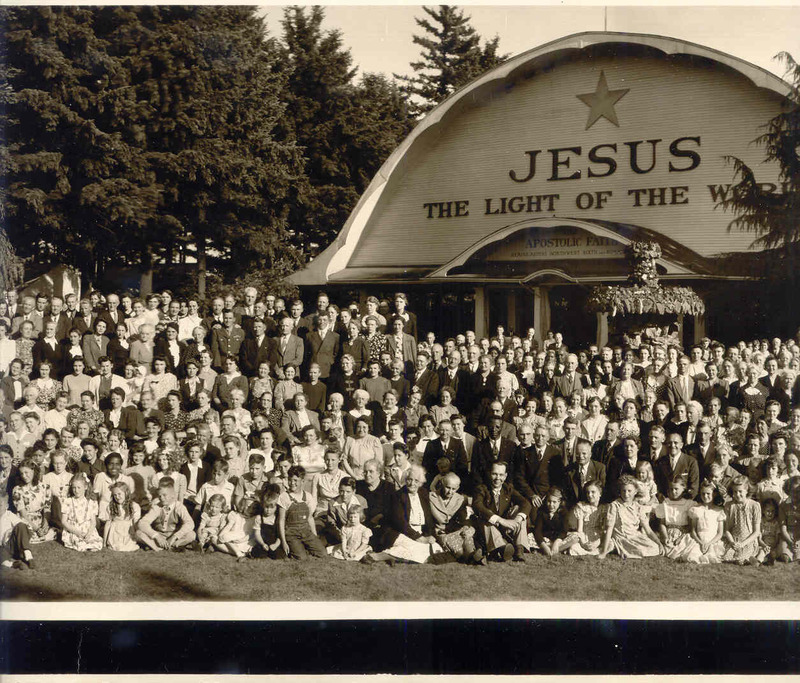 An 8 by 36 inch panoramic photo of the tabernacle and congregation has been chopped into four sections to better fit on this page. This picture was taken in 1918. A shortage of canvass during the First World War dictated that wood be used instead of a new and larger canvass tent needed that year. This was the fourth and final use of this campground as campground locations were used ‘by permission’ and required renewed permission each year. If and how much rent they paid is not clear, perhaps they had it both ways over the years. The 22 piece orchestra was organized June 22 of that year. Bro. Ray was the director. 3. Section three, center right. If you think you know someone who was there and at least three years old then, they are at least 90-years old now, so don’t even ask that question. 6. Street Workers in 1917 (in 1917 the tabernacle was canvass. In 1918 it was a wooden structure. 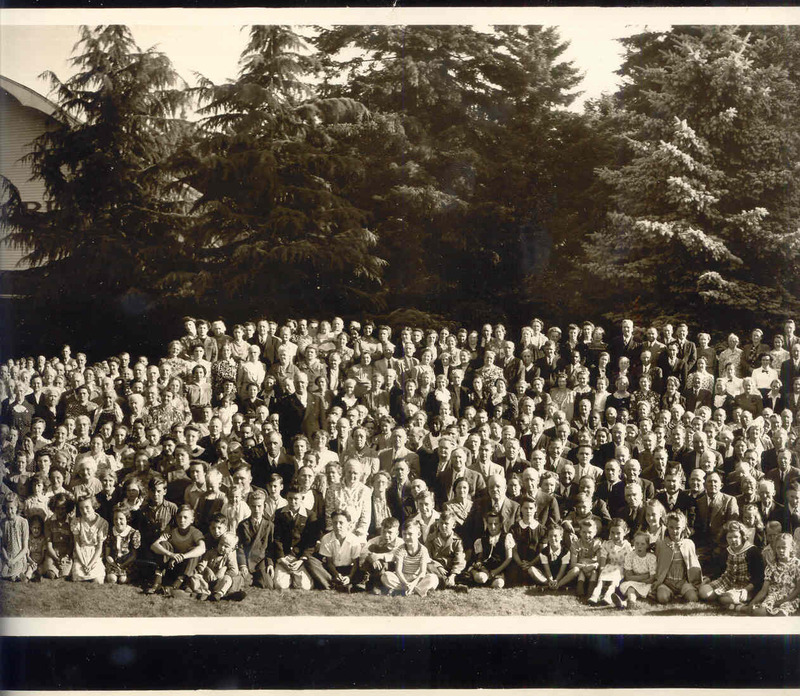 What was the 52nd and Duke Camp Ground like? 1. This Campground was first used in 1920 with a canvass tent tabernacle. 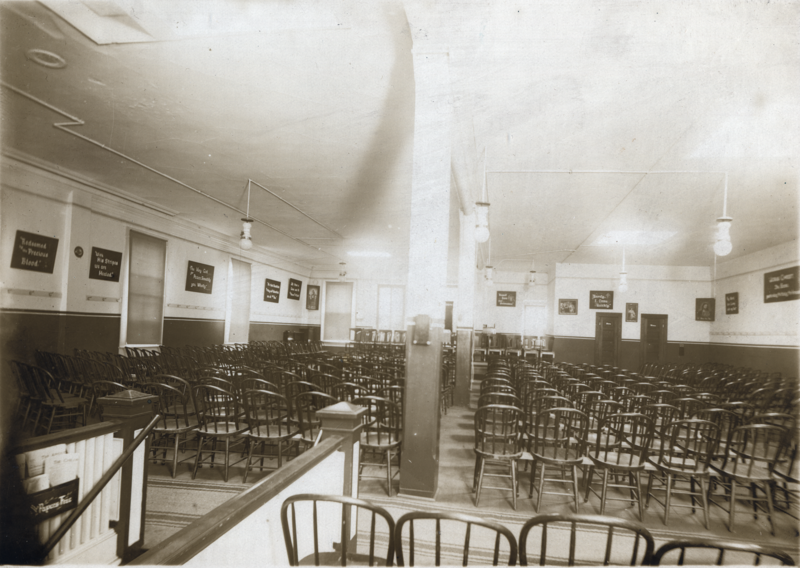 The building shown here was dedicated June 26, 1921 and continued unchanged until 1939. The dirt floor was covered with sawdust and the area around the altars was spread with straw. Canvass curtains could be ‘let down’ along the outer perimeter, but there were no permanent walls. Notice the roof line at left, this was to be changed later. This picture can only be dated as sometime between 1921 and 1939. 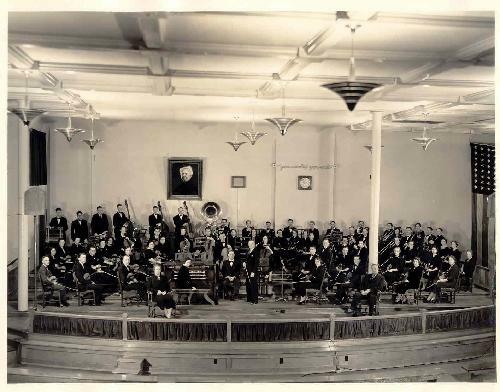 The orchestra was first organized June 1918. Cecil Banta (bass viol) was a charter member of the orchestra. 2. Although somewhat overexposed, we can get a good view out the unenclosed sides of the building and of the roll-up benches. A pivoted connection from the bottom of one bench to the ones ahead and behind it allowed the benches to be rolled up each night so the sawdust could be wet down to keep the dust down. Sister Crawford’s picture tells us that it was after her death in 1936 and probably before the wings were added in 1939. 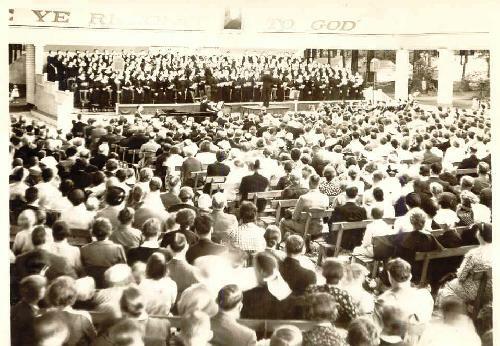 Camp meetings always had a concert! 3. Another view of the tabernacle as built. 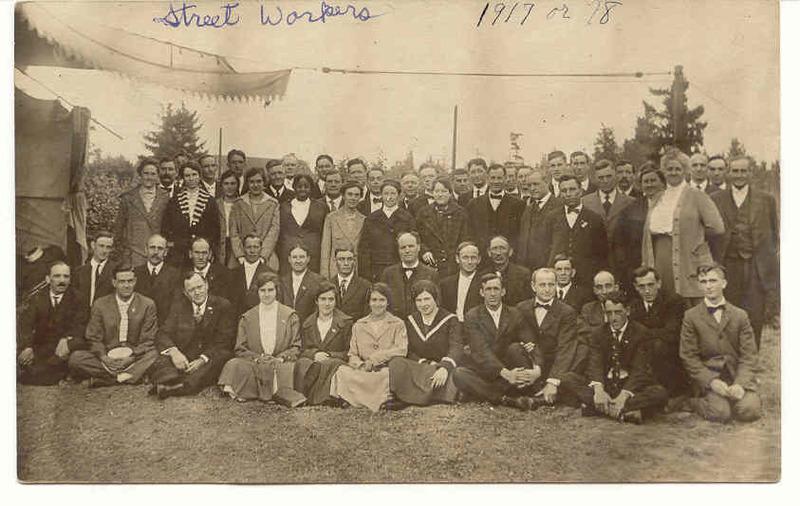 A photo of office workers here, obviously before 1936. I think the poor guy in the middle has been ‘disfellowshipped’. 4. Ready for street meeting in a car built for twelve. 5. Aww, we finally got wings. In 1939 a row of pillars was put in place eighteen feet outside the original pillars and the curvature of the roof was changed to accommodate the widened building. That’s how it was when I arrived a couple years later. To find out about the changes made in 1947, come see. 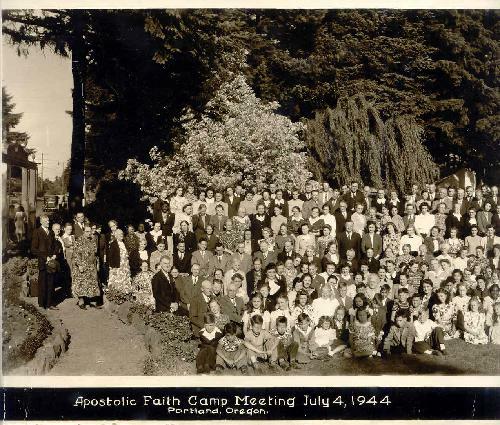 There have been no structural changes since those made following the 1947 camp meeting. 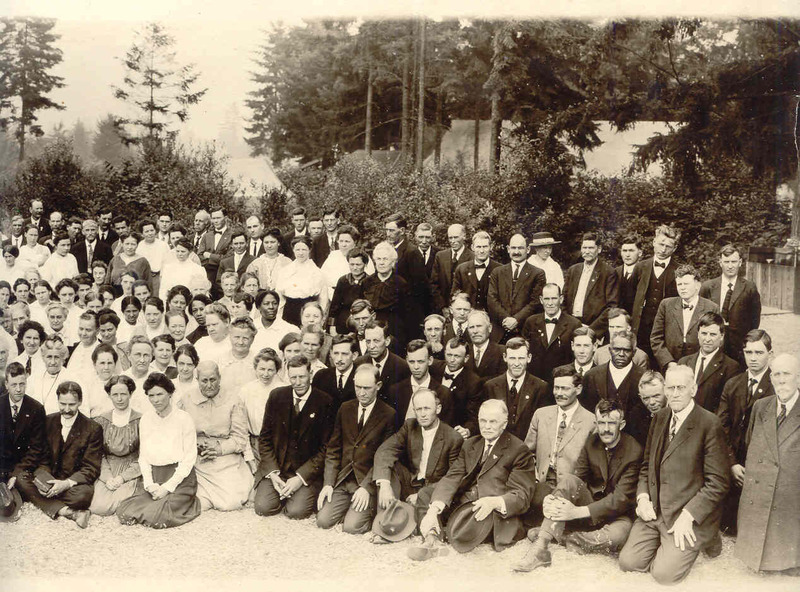 How many Gardeners can you name? 6. This photo, taken April 20, 2011 is a close-up of the front of the Tabernacle showing the modified roof line after adding the wings in the spring of 1939. 7. Time for pictures. 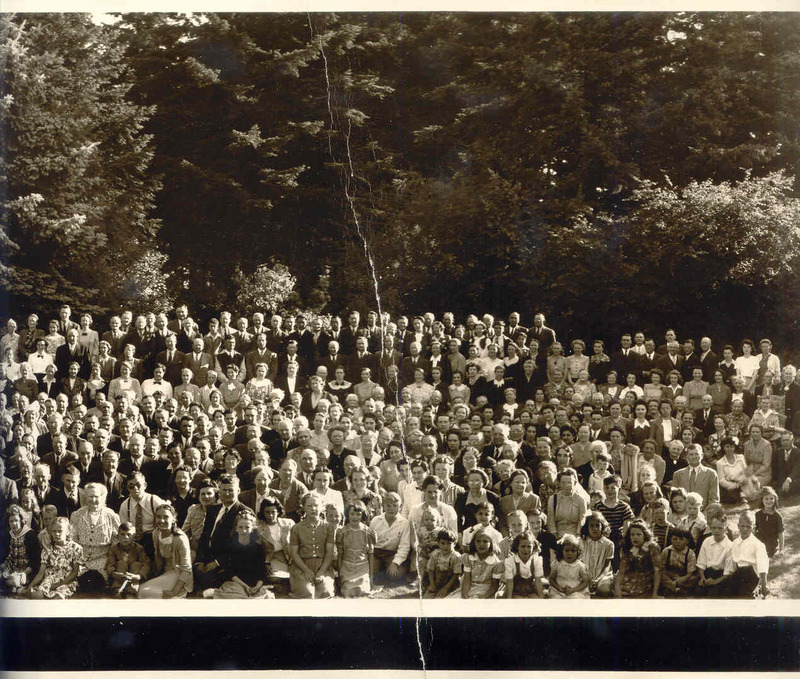 This 8 x 36 inch panoramic photo has been chopped into four sections to better fit the page. This is section 1, far left. I was fifteen years old and am nearly hidden behind a lady with black hair and a black dress. 8. 4th of July holiday and lots of people. Section 2, center left. 9. More people. Section 3, center right. 10. Finally got ‘em all in the picture. Section 4, far right. What was the Sixth & Burnside church like? Built in 1922, the church at Sixth and Burnside was in many ways similar to the church at Front and Burnside. The meeting hall was above ten commercial store-front spaces on the ground floor, but we were the land owners now. The church faced west onto Sixth Avenue on the north side of Burnside. In 1941, the church office occupied most of the first floor, but there were still a few store fronts opening onto Burnside. The last seventy years have dulled memories, but I think one of the stores on Burnside was a hat shop. Back then men were not considered properly dressed on the street without a hat; and yes, I had a hat back then. 1. Burnside was widened so the church had to give up twenty feet from the south side of the building. The wall was moved September 23, 1930. This meant reconstructing the commercial property facing Burnside. The platform was relocated to a different wall and a balcony was added to make up for seating lost. This is how it looked from 1922 until 1930. Saturday night, September 23, 1930 the south wall was moved twenty feet to the north. 2. It looks like a 150 voice choir concert. Must have been a full house, notice there are people sitting on the altar. We can only date this as after 1936. The picture tells us so. Music became an important part of church starting about 1918. 3. Another concert; orchestra this time. 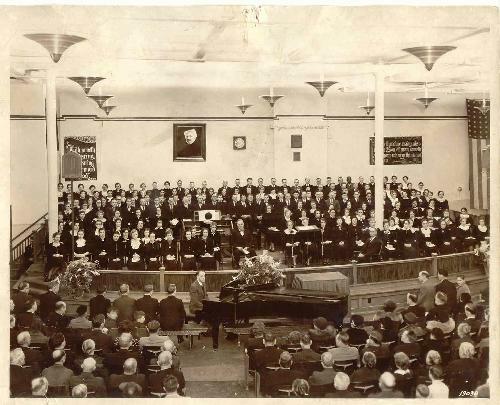 Since there are no mottos on the wall this picture might be newer than the choir photo. Sunday services were moved to the campground after the tabernacle was remodeled in 1947 but week night services continued here. May 23, 1980 a farewell service was held and the building sold. 4. 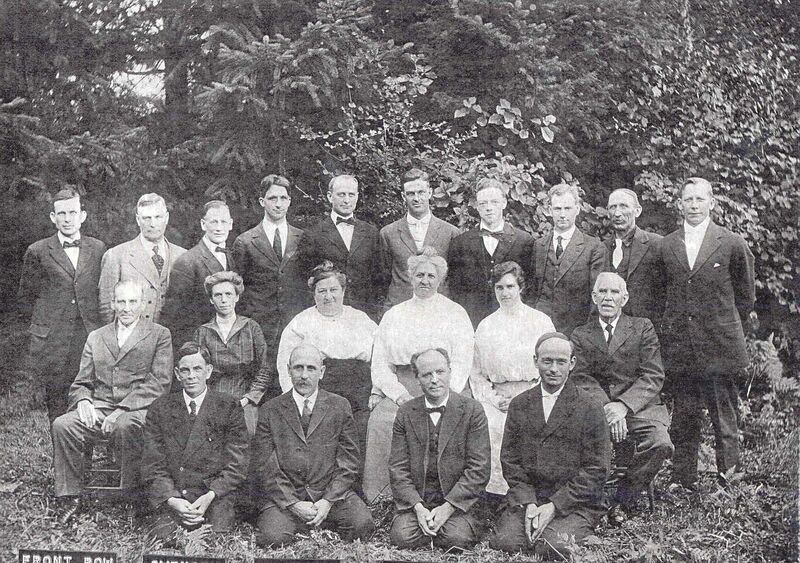 Although photographed during camp meeting, these are all Portland people, probably a male choir. If you are an old-timer in Portland you may know all these people. 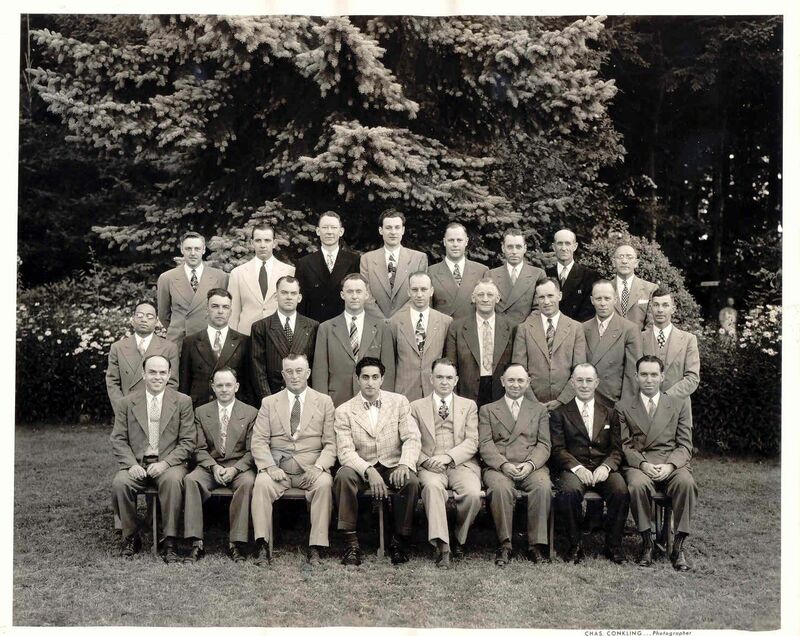 First row seated: Dan Trzil, Grant Hill, Harry Orwig, Ray Kaady, Cliff Baltzell, Glen Hadduck, Larry Snider, Tom Simpson. Second row: Phil Burnette, Bob Remley, Art Allen, Frank Hiatt, Don Dibble, Roy Allen, Art Hiatt, Walter Reid, Hershel Walden. 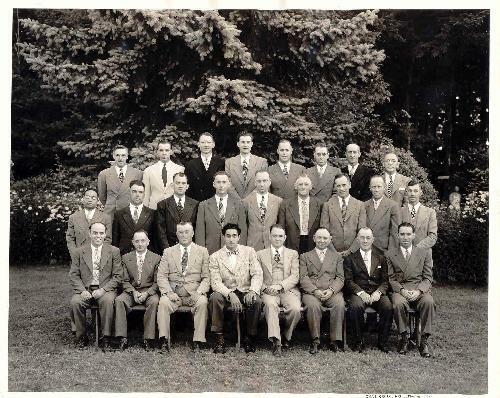 Third row: Bill Wager, Norman Giselman, Norman Allen, Walt Robanske, Stan Frank, Glen Day, Lester Hiatt, Hartvig Anderson. 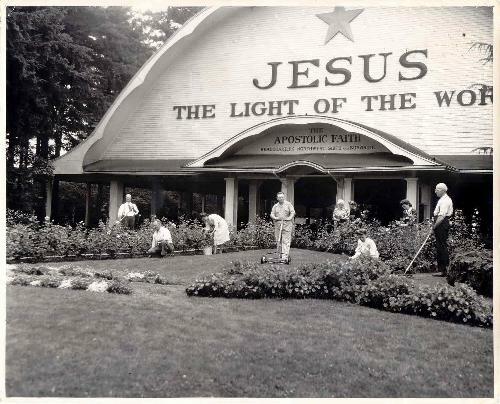 The new church is not history yet, so this concludes the gallery of historic photos for now.